The headline summarises it beautifully: "A small two-person winery in the Southern Rhone, farming organically, vinifying naturally, living the good life in Southern France". The two-persons are Amy Lillard and Matt Kling, the wife and husband team. 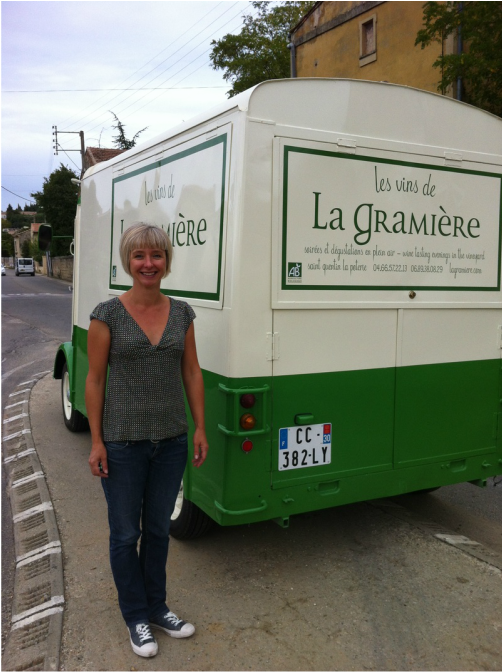 Amy describes their work at La Gramiere in these words: "Created in 2005 with just over five hectares of vineyards, we make hand-picked, artisanal wines in the Southern Rhône Valley of France. Vineyards have been farmed organically since day 1 (The organic certification took effect with the harvest of 2011). From planting the vines, to pruning to harvest, everything is done by hand. We have no employees, just a lot of great friends who lend a us hand when necessary. Our wines are made naturally with very little manipulation (no oak, no micro-oxygenation, no additives), just grapes (very good ones), a little SO2 and a lot of work. It is this is truly a labor of love! We feel our wines are the true expression of not only our terroir, but also ourselves, they are honest and true, and reflect what we both love in the wines of this beautiful region." As I have repeatedly said in my earlier posts, I believe that in addition to the terroir, the wines are an expression of and an extension of the wine producer's personality. That is why the wines that Amy and Matt make are firstly a reflection of them i.e. La Gramiere and then of the region and vintage! Amy and Matt are the new breed of winemakers who have followed their passion of drinking good wine into making their own wine. What is really amazing is that these wines are VdT (Vin de Table) as both Amy and Matt did not want to be bound by the French rules and regulations. Their wines are delightful yet rustic and deserve a whole new category definition! 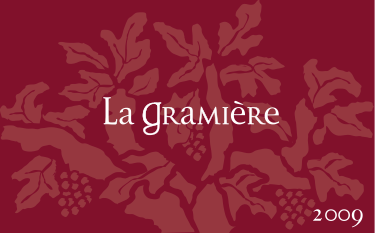 La Gramiere (The Green Label): This is their flagship bottling and is a blend of 80% Grenache, 20% Syrah. It is a deep ruby red and proffers up aromas of plums, raspberries, blackberries, provencal spices, tobacco, pepper and a trace of mocha. It is full and juicy in the mouth with terrific depth and balance followed by a most pleasant, lingering aftertaste. Specifically the 2009 vintage has the tannic structure that will enable it to age for another 5-10 years. Only 9,000 bottles were produced in the 2009 vintage. 2009 Peter's Vineyard Syrah (The Red Label): A blend of 90% Syrah and 10% Grenache. It is deep and rich with ripe red fruit and spice. It will go wonderfully with any lamb dish, roast beef and game. 2009 was a hot, ripe vintage with great tannic structure and the wine needs 3-5 more years in bottle before it will be truly ready to drink. Only 1000 bottles were produced in the 2009 vintage. 2010 Grenache (The Grey Label): This was a special bottling based on the 2010 vintage of 100% Grenache from the oldest vines. It has been aged for 24 months in unlined concrete tanks. This is a big wine with lots of tannic structure and ripe fruit. There were only 5000 bottles produced in the 2010 vintage. It's just not we at Cellar Door who are raving about their wines, La Gramiere were picked up by Jon Rimmerman of Garagiste who wrote the following "In this wine, I find peace...which is saying nothing and everything at once. In the same vein as my selection of Chambers St as the top retailer of 2011, you never feel as though La Gramière has an agenda – there is no motivation to sell anything and no motivation to win you over by promoting, marketing or wishing for something that could (and should) come naturally to those that choose to amble through an evening or two with a kindred spirit that eventually becomes a confidant. In wine, that confidant is La Gramière." For those interested in knowing more about Amy and Matt I would recommend you click through to their video on the Kickstarter website. The background - a few years ago they wanted to extend the boundaries of their vineyards and create a mobile tasting room. They bought an old vintage Citroën that served as a horse trailer and converted it to a mobile tasting room/wine bar. We hope you like these wines as much as we have! This entry was posted in Meet the Producer and tagged Grenache, Syrah, Southern Rhone, Natural Wines, La Gramiere, Saint Quentin la Poterie on 4th December 2014 by @thecellardoors.